On the worldbuilding stack site there is a tag called hard-science. When this tag is used, it generates the following text. The use case on this site, would be questions like this about being bit by a snake or this one about removing a fishhook, or this one about acclimatization. In all of those cases, there is good information about what to do from reputable sources. I think that requiring sources would greatly improve the quality of the answers. Personal experience is great, but it is all but impossible to verify and I think that the site would be much better off by requiring sources for certain questions. There is another possible option seen here on the Latex stackexchange site. What it is a long list of prepared responses to common scenarios with links to meta posts already set up. For instance, if someone was not actually answering the question, we could have a prepared text that linked to this meta post. I think this would be a wonderful idea. In my opinion the tag should be called science-based. This is because we're looking for a scientific answer to the question, and hard vs. soft science is fairly meaningless to what we're trying to achieve. This question asks for science based answers. All answers to this question should be backed up by equations, empirical evidence, scientific papers, other citations, etc. Answers that do not satisfy this requirement might be removed. See the tag description for more information. The body of the tag description should be an adapted version of the hard-science tag description. They are incredibly more discoverable. I personally never knew that I could/should flag my own post to ask a mod to put a mod message limiting the types of answers I would accept. Now that I know this it makes sense, but conceptually I view flags about problems. They don't rely on mod intervention. My understanding of the SE moderation model is that we should empower the commoners to handle things with out the intervention of mods/high rep users as much as possible. It makes searching for science based answers much easier to a given problem. Mod messages don't help with searching. It makes it clear that the person is asking "why does XYZ ..." instead of our more standard "what ... for XYZ." 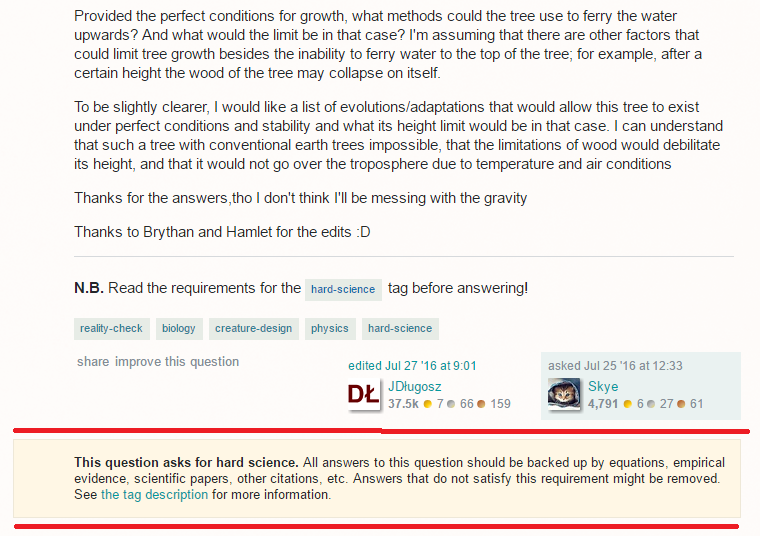 Tags are meant to describe the subject of the question, not to express other things like how hard the question is or (in this case) the conditions about how to properly answer the post. If the author is looking for a particular type of information, they should express those requirements in the body of the post. But it would be community unfriendly to disallow an answer out of hand because an unsuspecting user did not read the description of every tag in the post. Tags do not change the context of a question. This is inconsistent with the feature set and how folks have come to expect Stack Exchange to work.